Thousands of dogs are expected to march on Westminster to protest against Brexit, this weekend. Organisers say up to 5,000 dogs and their owners will take part in the “Wooferendum March” which will reach Parliament Square on Sunday afternoon. The march will protest the likely suspension of the EU Pet Passport scheme when the UK leaves the European Union. The programme currently allows more than 250,000 animals to travel overseas with their owners. 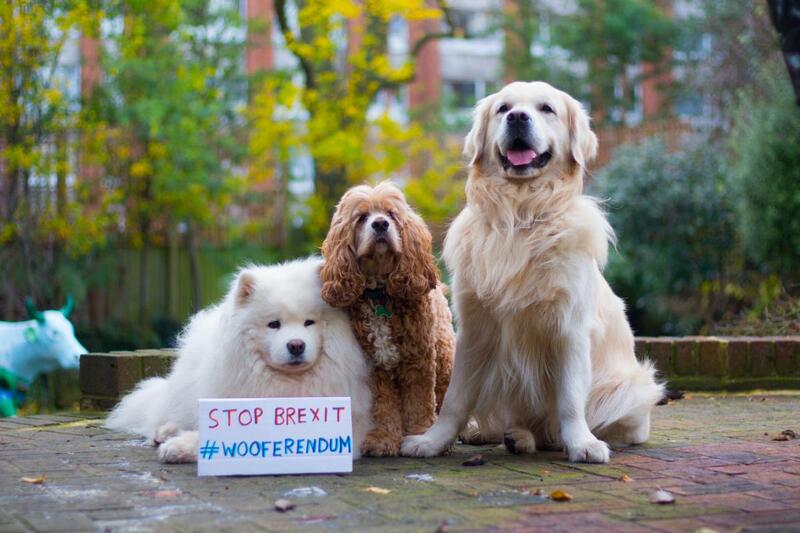 The march is being organised by the campaign Wooferendum, which originally started by posting photos of dogs posing with ‘Stop Brexit #Wooferendum’ signs on posters and bus shelters, to help people talk about Brexit. Daniel Elkan is the founder of Wooferendum, a campaign “of dogs barking out to give people a voice”. Mr Elkan said that Brexit is often a hard topic to talk about, and he hopes the march on Sunday will give people the opportunity to add their voice to the debate. He told talkRADIO: “If you love dogs, if you think people should have a chance to give their say with a People’s Vote; there is no event in history that is going to match this one. 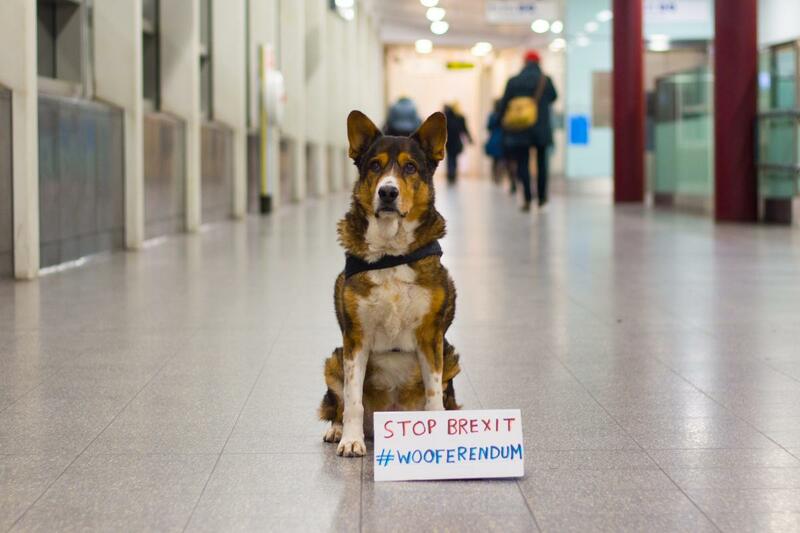 Mr Elkan added the enthusiasm for the Wooferendum campaign had been “incredible” as a way of creating a “friendly” way of talking about Brexit. He added: “I imagine many of the people who have sent in photos of their dogs were not at the forefront of the Brexit debate before. “Dogs and their owners are coming from all as far away as Devon, Norfolk, Manchester and Cardiff to be in London. Speakers at the rally at Parliament Square will include actor Stephen Mangan, Our Future, Our Choice founder Femi Oluwole and animal welfare campaigner Dominic Dyer. Mr Dyer, who was also one of the organisers of Wooferendum Dog March, said: “We know Brexit will be disastrous for the people of Britain but it could also be equally bad for our pets. “From a shortage of skilled vets and vet nurses, to rising costs for animal health and pet food products and even the end of the EU pet passport scheme, Brexit will be disastrous for the nations dogs and cats and other companion animals. Former Downing Street Press Secretary Alastair Campbell will be marching with his cavalier King Charles puppy, Skye. Mr Campbell, a leading supporter of the People’s Vote campaign, says "We have to do everything we can to show the politicians that the country is not uniting around Brexit. “The idea that we have to choose between no deal and a bad deal is a democratic obscenity." The Wooferendum’s march falls two weeks ahead of the People’s March on October 20. After the dogs march to Parliament, a PETition signed by owners will be delivered to Downing Street. The march will begin at 12pm at Waterloo Place, SW1Y.